The defendant on the "Hizb ut-Tahrir case" called to fight for the freedom of political prisoners who are being held in Russia. Lawyer Emil Kurbedinov published a letter from a Crimean, the defendant on the Sevastopol "Hizb ut-Tahrir case" Ruslan Zeytullayev, who had been sentenced to 12 years in prison in Russia. 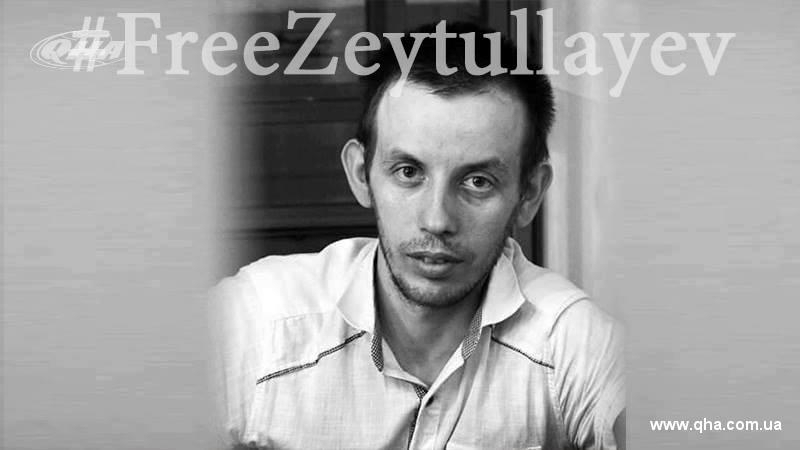 Zeytullayev called the decision of the North Caucasian Military Court to deprive him of his freedom for 12 years "illegal and unjustified," and he called Russia, where the trial had been held, "an alien state." He remindes about his decision to go on a hunger strike and calles on all those who are not indifferent to fight for the liberation of political prisoners in Russia in the letter. “I ask all to fight actively for the return of all the Kremlin's political prisoners ... It was the civil active society that made a great contribution to the release of a number of people from captivity. Personally I believe that all of us, political prisoners from the Crimea or mainland Ukraine are in captivity”, reads the letter. Ukraine will be able to overcome all problems, since "there are many good people, civil activists, and their number is constantly growing", he notes in the letter. Reference: January 23, 2015 four Crimean Muslims were detained in the Crimea for the alleged involvement in the organization "Hizb ut-Tahrir", which is recognized terrorist in Russia. Since June 1, 2016, their case has been considered in the North Caucasus District Military Court. Ruslan Zeytullayev was sentenced to seven years in prison, Ferat Sayfullaev, Rustem Vaitov and Yuri Primov were sentenced to five years' imprisonment. All of them must serve their sentences in the colony of the general regime. December 27, 2016, the Supreme Court of the Russian Federation quashed the verdict against the Crimean Tatar Ruslan Zeytullaev and forwarded the case for revision to the North District Military Court of Rostov, thereby satisfying the complaint of the prosecution who claims that Zeytullayev was allegedly the organizer of the Hizb ut-Tahrir cell in the Crimea and required to charge the Crimean Tatar under Part 1 of Art. 205.5 of the Russian Federation Criminal Code (providing from 15 to 20 years imprisonment) instead of Part 2 of Art. 205.5 of the Criminal Code.